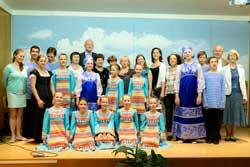 The Women’s Federation for World Peace in Austria hosted the «Angels of Peace,» a Russian children’s troupe, on a cultural exchange tour from June 22-29, 2014. The musical «Bridge of Peace» program between Austria/Europe and Russia/Eurasia took place in five Austrian cities: Graz, Linz, Salzburg, Vienna and Neckenmarkt, with a total of more than 600 guests. This project began in 2007 in Moscow, initiated by the Russian chapter of the Women’s Federation for World Peace (WFWP), with social dance performances of children between the ages of 9- 14 years oldat senior citizens’ residences and other establishments. The Angels of Peace Tour with Russia-Austria partnership was one more step towards reconciliation, exactly 100 years after the beginning of World War I, due to the tragic assassination on June 28, 1914 of Crown Prince Franz Ferdinand and his wife Sophie, who had attempted to restore Austro-Russian relations while maintaining an alliance with Germany. World War I brought devastation throughout Europe: 59 million troops were mobilized, more than 8 million died, and more than 29 million were injured. In addition, June 22 was the 100th anniversary of Berta von Suttner, an internationally respected Austrian pacifist and author of «Lay down Your Weapons»- and first woman to receive the Nobel Peace Prize, in 1905. The first event in Graz, on June 22, took off with a tri-sponsored event at the WIKI seminar center with WFWP Styria Suzuko Hirschmann, the president of the Austrian Russian Association in Styria Dr. Peter Presinger, and UPF-Styria leader Johann Pranzl. The Angels of Peace took a city tour sponsored by the ORG and afterwards enjoyed ice cream sponsored by UPF. President Dr. Peter Presinger opened the afternoon performance and received an Ambassador for Peace certificate recognizing his years of dedication to advancing Austrian-Russian relations and partnerships. The Bridge of Peace was celebrated between Russian and Austrian women, introduced by Renate Amesbauer (president of WFWP-Austria) who was one of the initiators of these reconciliation ceremonies in Austria. The Angels of Peace dance group initiator Mrs. Olga Vakulinskaya, (president of WFWP-Russia and vice president of WFWP International) moved the hearts of all, as she expressed on behalf of the Russian peace bringers the desire for reconciliation between both nations. The Angels of Peace and each teacher received a certificate recognizing their dedication to world peace and as appreciation for their long journey to Austria as well as the many practice hours studying the traditional dances. Also a small sweet was given to each participant by the mayor of Graz’ office. «Reconciliation and peace became more real through this beautiful inspiring afternoon. Thanks to all who have made this possible.» This was one of the comments following the performance. A cultural peace message and a special memorial ceremony with the laying of floral wreaths and sprinkling of Russian earth at the soldiers’ graveyard embraced the village of Neckenmarkt in Burgenland, east Austria on June 2e. More than 700 soldiers are buried there: Russians, Italians and Serbs. Short speeches were given, the Angels of Peace sang two songs, tears flowed, and the sun shone! The Angels of Peace took some earth from Neckenmarkt back to Russia. During World War I, the largest recorded prisoner-of-war camp was in Neckenmarkt; it was more than 2 km in length and housed nearly 40,000 individuals. However, the prisoners experienced some degree of freedom and worked on farms and other establishments, occasionally without a guard. It is said that some wanted to marry the village girls, but this was not permitted. The mayor of Neckenmarkt, Mr. Helmut Iby, invited all present to the «Gasthof Traube» after the memorial ceremony. Mag. Dr. Oswald Gruber, a local history teacher, gave a profound overview about World War I, and Dr. Mihalkovic explained about the prison camp. All three were greatly moved upon receiving an Ambassador of Peace certificate after the performance. The Angels of Peace danced directly beside the audience, bringing many to tears! The «Bridge of Peace and reconciliation» revived each heart. A journalist who had attended the evening program publishing an article in the local newspaper with photos, in addition to publishing many photos on the newspaper’s website! On June 26, the Angels of Peace travelled by coach to Linz. Upper Austria was divided into a Russian zone and and American zone along the Danube embankment from 1945 to 1955. Engaged couples living south of the Danube who wanted to marry in the Basilica of Pöstlingberg needed permission from the Russian zone. This basilica of the «Seven Sorrows of Our Lady,» has a spectacular location and is the landmark of Linz; it is a popular church for weddings and is now a shrine for those who perished in both World Wars. 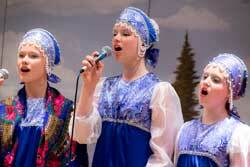 In one of the city’s district community centers, «VolkshausAuwiesen,» the Angels of Peace performed songs and dances conveying the rich cultural heritage of Russia. The charming appearance of the 14 young artists soon touched the hearts of audience of about 80 people, who joined in with clapping along to familiar tunes. Olga Vakulinsky, initiator of the Angels of Peace expressed her concerns about the wounds Russians and Austrians caused each other during the two World Wars and conveyed her sincere desire, on behalf of the Russians, for forgiveness and reconciliation. The Bridge of Peace Ceremony brought eight Russian and eight Austrian mothers and 14 young people of both nations together; they asked for forgiveness, voiced their commitment to peace, bowed down to each other entering the bridge and embraced one another in the middle of the bridge. This ceremony and especially the physical embrace moved the hearts and created a remarkable bond and peacebuilding energy, not only for the participants of the ceremony but to all present. Appreciative remarks by the Linz city council Mag. Marie-Edwige Hartig, originally from Cameroon, and flower presentations ended the evening. On June 27 the Angels of Peace arrived in Salzburg and had lunch in a WOK restaurant. Afterwards they checked into the Kolpinghaus youth hostel before continuing to the Bachschmiede in Wals. Lamprechtshausen Music High School Class 1a (24 children) sang typical Austrian songs in a local language without microphones. Accordion music and a fantastic drum group performed. The Goeming children’s traditional dancing group (14 children from 4 to 9 years old) in traditional costumes and hats with accordion musicians were met with rhythmic clapping from the audience. Ms. Fiona Hawlin, chair of WFWP-Salzburg, invited these two marvellous local music groups to sing, dance and play, successfully making a Musical Bridge of Peace. Erika Ortner charmingly and gracefully brought this Musical Bridge of Peace evening program to a close, introducing the Angels of Peace families to the audience. Presents were exchanged and flowers were given to the Austrian teachers and the organizers. The performance was filmed at this event and will serve as a documentation. Tears were in the eyes of the evening audience upon leaving. Josef Voithofer, president of the Austria-Russia Association in Salzburg, helped in the preparatory work. His office staff, Mrs. Ortmayer, designed the poster and assisted with the event arrangements at the Bachschmiede. This poster format was used for each city. On June 28, the Austria-Russia Association also sponsored sightseeing in Salzburg for the Angels of Peace. Ms. Olga Vakulinsky explained this was a dream fulfilled to travel on a cable car to the Untersberg. Ms.Fiona Hawlin, chair of WFWP-Salzburg, organized and sponsored the lunch at the Lachensky Hof before the Angels then traveled to Vienna. Groedig was remembered as well. Approximately 40,000 Russian prisoners of war and Russian refugees were held there. Elisabeth Riedl referred to them as «the forgotten prisoners of war.» According to the Groediger community records, more than 2.000 people died, and author Gerda Dohle explained in her book there were surely more. Witnesses estimated 17,000 to 23,000 dead. A large cemetery lies near Untersberg, and the Russian graveyard reminds one even today of the prison camp. On November 15, 2014 there will be a memorial service held. «Around 3,800 people are buried at the Russian Cemetery,» explained the cemetery officer, Sepp Haslauer. Russians, Serbians and Italians, Russian Orthodox, Jews, Catholics and Muslims, as well as 800 children, were buried here, the latter having come from the Vojvodina refugee camp. On June 29, official greetings were given to the Angels of Peace in Vienna by Ms. Olga Schalaeva, attachée from the Russian Cultural Institute. The end of the tour came in Vienna as a collaboration between UPF and WFWP-Austria. The Peace Angels each received a Women’s Federation for World Peace Youth Ambassador for Peace certificate in recognition of their dedication to peace. The event location, the Austrian Peace Embassy at Seidengasse 28, was filled to the last seat. The children see themselves with their performance as a «bridge of peace» between different countries and nationalities. The founder of the dance group, Olga Vakulinskaya, said: «Through this dance group I want to give the children and young people the opportunity to become ambassadors of peace, to learn that the most important thing in life is to be a loving person, with a willingness to help others.» The performance featured «Moscow Nights,» «Dance of the Tartars» and «Boleveskaya Pushcha,» as well as international folk songs. The audience clapped as tears ran down many faces witnessing the beautiful costumes and the purity of the Angels’ faces and hearts! This all in the knowledge that with this event came the end of five performances of building a musical and historically memorable Bridge of Reconciliation between Russia and Austria. The Angels of Peace spent one more day in Vienna, relaxing and shopping for souvenirs for those back home. Appreciation goes to all the sponsors generosity, especially to the Austrian Russian Friendship Association in Graz, Styria President Dr. Peter Presinger and Salzburg Mr. Josef Voithofer, the Vienna City Cultural Office, UPF-Neckenmarkt and Wals near Salzburg Mayor’s offices, the Salzburger Nachrichten, Die Fenster, the Progress Advertising Agency in Salzburg and several Ambassadors for Peace including local WFWP city representatives who contributed their time voluntarily for the organization and public relations work.